$USHL back to the (low) level seen in May 2012 and Nov. 2011…so a rally is very possible. I am waiting for the hook (up) in my breadth indicators to commit more longs. 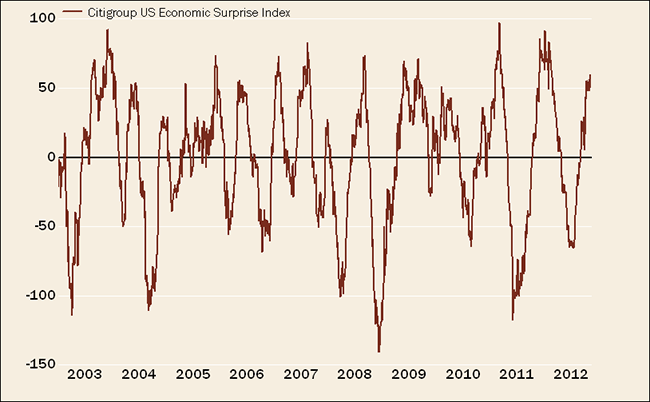 In jul07-ago07 Economic suprise for US were near 100, and in the summer of 2008 and after near 100. In jan-feb11 again 100, again beginning 2012. One asking question is if we are seeing a new peak. Look to LQD:TLT (weekly, a pretty good leading indicator for SPX) for guideline for the quality of the ensuing rally.. It better hook up very soon to confirm the rally or else a MACD bearish cross would mean more sales on Wall Street ahead which is welcomed for me. $NYHL candlesticks like very similar to June 1, 2012…a gap up on next Monday will mean a Thanksgiving rally is most likely for real. SPX daily chart printed a (almost perfect) Hammer. $NYADV:$NYDEC (ema 10) printed a good size hook (up). Also, we have a VIX negative divergence to price… VIX lower highs since Oct 23, 2012 while the market tanked….so what gives? I can add to that Edwin – Rob Hanna’s Capitulative Breadth hit 11 on Friday – 7-10 or above has reliably called bottoms in the past I have found. “Mark Twain wasn’t writing about the gold market when he made his famous quote about historical recurrence, but he could have been, as the gold market has been “rhyming” every 21 months. Every 21 months there has been a major peak in the gold market, going back to the start of this bull market, over 13 years ago. First Para of your update ” bear valaue has been reached ,namely China , Russia , Japan and Austria. Is the last one Austria , or Australia …..maybe both , as I am Australian and believe its appropriate for our ASX here as well . I meant Austria. Australia hasn’t reached the same cheapness by p/e or CAPE, in my opinion. John, sent you an email. I’d appreciate any thoughts, feedback, or criticism you can provide. I am sure I am going to get panned for this call by the readers, but I am making it and I’ll lay out details to exactly why (though charts are easier). Bear with me, it is long, but you may find it very helpful. 1. Bond yields are indicating a the S&P 500 should be priced below 500. Using the analog of the TOPIX and JGB’s as well as previous history for our yields and equity prices, the divergence of lower yields and higher stock prices closes and it is has always been the stock prices which have got it wrong. The S&P 500 adjusted for inflation has been traveling in a downwards channel since the 2000 highs with perfect bounces of the top and bottom of each the channel. The Fib Retracement (2000 Highs, 2002 Lows, 2007 Highs) was perfectly achieved at 668 (100%). Remember, these are inflation adjusted figures. In doing completing the same pattern, a 100% fib retracement (2007 Highs, 2009 Lows, 2012 Highs) would put the S&P 500 at 431, corresponding with the return of equity prices to bond yields. 3. Using the EUR/USD from 2000, an interesting analog appears. This analog is not a time perfect analog however if you look at the rise in the EUR/USD rate from 2000 to 2007, it looks much the like rise of the S&P 500 from 1995 to 2000. After it peaked, the EUR/USD has in a downwards channel, making lower highs and lower lows. If this current pattern is compared to the S&P 500 adjusted for inflation, the 2011 High is where the S&P 500 currently stands. As we know, the EUR/USD has been in a bear cycle since then (price of around 1.50). 4. Using log scale charts for the S&P 500 nominal prices (not inflation adjusted any longer), we can see that previous market events have acted as points of support and resistance. As an example, if you look at the crash of 1987 and draw a line from its bottom and through the bottoms of the prices in 1990 and 1994, you find that the 2002 – 2007 bull rally had a great point of resistance in that line. Of course, when it reached its 2000 high, a new form of resistance took hold. We now are a convergence of resistance barriers acting against us. The high of the rally after the 1929 crash and the Great Depression bottom of 1942 lines have converged together last month. These lines have acted as great levels of support, but then turned resistance a while ago. The support level we have is from 2009. I say this because historically these lines of longer time periods (1930s, 40s) have historically shown to be more respected than a newer line, such as the 2009 support line. 5. Since the volatility highs of 2008, volatility has been compressing and like a Coca-Cola bottle shaken up, once opened, it spews everywhere. The compression of volatility (by the Fed or whoever) will end in much higher levels of volatility than recent and maybe higher than 2008. Lengthy, I know. However I believe we are about to experience an extreme awakening of collapsing equity prices. I have went from semi-bear to full blown bear – of course I could be wrong and modern day financial models say I am – but if I am right… well, it will most likely have to be driven by a Black Swan event. Also, the 45 year cycle chart which correlates to our present S&P and the one year ago Eurodollar COT chart appear to indicate steep drops into what may be the March – May time frame that you predicted. Although, unlike the 45 year cycle chart which drops then pops to new highs by December 2013, the COT chart does not pop up to new highs but appears to keep on dropping. I’m wondering if a war could disrupt the correlation of the 45 year cycle chart for a couple of years. I have seen this, but did not factor into my analysis. I believe we revert back to the original break out, in the mid-90’s. If we look at price distribution in the S&P 500 since 1871 on an inflation adjusted basis, 1000+ point closes are a fairly new occurrence. I would turn to a major bull should we get back to these levels. I have been a long term stock bear, long term commodities bull for a while. I’ll stay that way until we move to a state in which we trade more along the book value like the rest of the world. Questions is if a war is really a black swan event. I find it more cyclical. If many people are thinking about it maybe it can not be a black swan? ryknow, charts would be great! tia. btw, I completely agree with your assessment. I think it could take a year + to get down to those low numbers but I too think they are coming imo. Most (including this site) see no “serious” risk in equities anymore. Oh well, no one can say they were never warned. Those are the main charts I am focused on – the EUR/USD analog is just an analog focused on price speed (fast), the 60’s-70’s SPX analog is focused on price action (not how fast, but similar pattern). John, so you are looking at it from a solar cycle level? I am looking at it solely from a price action standpoint. While no analog is perfect, my charts tell me that much like the 1970’s bottom, which wasn’t “all in”, neither was 2009. Also, if you compare tops and bottoms of the markets from 2000 until today, there was always consolidations and retests before we climbed higher (lower), however 2009 was not the case, where we V-ed up and never gave that bottom a second glance. There are one more important chart (I think) that I didn’t share that I will share here. Again, this SPX log scale showing the 1987 crash bottom turned resistance in 2007 and the actions that followed – look the the purple dashed line. Look at the chart again and see the resistance points of today, they are the solid blue lines. We are converging these 3 lines which are: 2000, 2007 double top, the top of the market in 1936 and the bottom of the market in 1942 (great depression bottom). The 1936 top had acted as major resistance through the 1990’s until the market had its great 5 year rally period, which then it turned into support. However, after 2007, it has moved back to resistance. The 1942 bottom was support up through the 1970’s, which during the great inflation period, then turned resistance and acted as such through the mid-80’s, however it again turned to support and held firmly during the 1987 market crash and then the 2002 bottom. Again, 2009 broke this as a support level and it has now turned resistance. So we have two very long term trendlines acting as resistance plus a more recent trendline, that being of the tech bubble, all converging to this (or around this) point. The charts have shown historically that these periods act as strong levels of support or resistance, depending on where they lie at a given period in time. The next great support line runs through the same bottom of 1942 but connect the mid-1970s bottom and the 1982 bottom (which was a huge reversal). This support point lies between 700-750 depending on the speed at which we were (if) to reach the line. If we break that as a support, the last major support point is all we have left, which dates back to the ultimate bottom back in the early 30s. That trendline support runs between 450 and 500. Some of the previous charts I posted show these lines, so check those out if you have any questions. If we scale out and look on separate time frames on this graph you will notice the bubble pattern in various sets of time frames. If you then zoom in again and you will notice it again. I would argue the pattern is the historical path of human civilization and it will continue this way until one day when humanity might be destroyed. If we had a longer time frame for financial assets it would continue this way. In the long run it all looks like an exponential curve as the development of many organisms in the universe such as bacteria. Interesting charts and analysis Ryknow, thanks for sharing. To be clear, is your SP500 target an inflation-adjusted one, as some of your analysis is in those terms? What happens with inflation will make a big difference. By history, cyclical stocks bulls end with inflation up, yields rising and a choking off of excess bullishness. We don’t have those currently. So we are either making an anomaly, and a cyclical bear has begun without those, or we have to yet to get to that point. 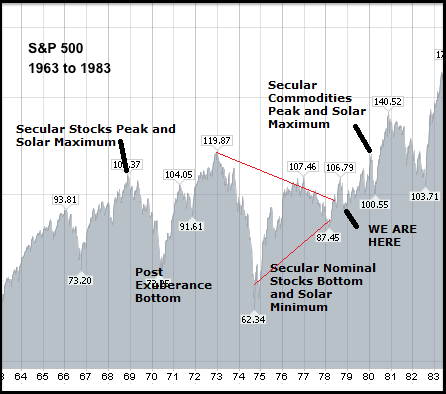 By solar/secular history, any third low in a secular stocks bear (which is the one ahead to which you are referring) has been some way higher than the previous lows. This is nominally speaking, which is why I ask if your target is inflation-adjusted, but there is no historical precedent for a deep 3rd low – history shows us that stocks largely wind out sideways, which is what I have covered previously several times. Of course history does not have to repeat, and this time could be different – but I suspect the US would need to be ‘broken’ for that to be the case. I don’t believe it is at that point – further down an unsustainable path, but not beyond the crunch point. I’m not sure I buy the zerohedge japan yields analogy. Bond yields don’t go hand in hand with equities. Bonds wave over longer timescales than equities, with long periods of them going opposite ways. As you know, I expect a cyclical stocks bear ahead, the last of the secular bear. But I would rather expect it to begin as of Q1 2013 rather than end around then, and I expect it to be something fairly mild, something just over a 20% nominal drop. And to Jack’s point, war and revolution correlate historically with solar maximums, so I see that as very much possible, and rather expect it as a push on commodity prices to help reach the secular climax. But that’s clearly with an eye on the Middle East, as what war and where will be determine how it affects asset prices. John, inflation will be rather void considering how fast my target comes. If it were a longer period, which it may be (say 24 months), then I would have a harder time on a target, that is it may be 25+ points up or down. However, predicting a Q2 2013 price of 450 – 600 inflation (at that time) won’t matter much. OK, understood. Then I repeat my point that there is no historical precedent for your prediction (at this stage in the secular bear, and so on). Doesn’t mean it can’t happen, but I stick with history as my guide, as I don’t believe this time is different. With negligible interest rates, ultra low bond yields and various key stock indices around the world close to secular extreme cheapness, I believe there will continue to be a bid under the market at a higher level than you suggest. However, this is what we have. What we do have a historical precedent for is bubble formations, and this is fits it. The question is, what gives? Do stocks crumble? Do yields rise sharply? A bit of both? I don’t know that answer, what I do know is that history has shown that price formations, regardless of the asset, cannot sustain these moves. Is this the top? I have no clue, however we have plenty of catalyst in place. I don’t see why, for ANY reason, the Fed would let rates rise. Therefore, if you assume they won’t and this chart “collapses” due to higher yields, then we have to assume that the Fed lost control of yields. If that is the case, this is not bullish for equities at all because the backstop we had since forever-a-go has now been voided and the “free” market has taken back over (e.g. the ole’ bond vigilantes return from the grave). I think it is stocks that go however with yields slightly down to flat. Maybe slightly higher. Don’t know, but I know this is not sustainable. Again, the question, as always, is when? Found an article which sums up the prediction I’ve made for stocks, the dollar and gold. It says that the dollar will weaken between now and 2015, commodity indices will soar, and the Dow could put in new nominal highs in 2013, before the high inflation weighs down on consumer spending. Please post a link to the charts I would like to see them. Please see above Kerry. Thanks. Hey Kerry, I struggle to understand the statement “things aren’t as bad as they were back then”? Globally, I believe you are wrong. Debt has piled up. Could it pile up even higher without reactions from either the bond or stock market? Sure. I don’t know what the magic number is. As I stated in my first post, while the chances of reaching my levels at the pace I am taking about isn’t impossible, it is highly improbable. Modern financial models would tell me something terrible would have to happen to get to these levels that quick, that’s why I am very cautious with how I even put on a bearish position. However, as shown in one of the charts, 2009 was a V-bottom, unlike any top or bottom we had since the top of 2000. All other tops and bottoms have had some sort of consolidation before making their move. Yet we disregard this. 1. A dump of liquidity in the markets by the Fed. This is no shocker however the idea that this can have the same effect forever is downright silly. When does it end? Apparently the market is saying now, but that could change. Maybe this QE3 (infinity) works like a charm for equity prices. 2. Corporate profits are up but take out expense controls (in particular layoffs) and things aren’t so pretty. Company’s can only cut so much before they’ve stripped down their workforces to the bare bones and have to been to generate organic growth and not manufacture earnings growth through operational controls. While revenues and margins are healthier than in 2009, the consumer is not so much. 3. As John has pointed out before, the US stock market is overvalued relative to its developed peers. I subscribe to the notion that we are headed for a Japan like scenario more than we are a Zimbabwe or any other hyperinflation case in recent history. I believe this will change in due time, however when the US is at roughly 2.15x book value and Japan is at 0.79 – if we are headed for that scenario, we have a ways to go … and I don’t companies are just going to up and grow their equity all that much higher. I don’t think things are as bad as 2008/9 as back then individuals were overleveraged and banks were badly exposed to defaulting consumers, particularly in the US and UK and certain European countries. This exposure had been transferred from the private sector to governments and is still an issue for sure. Most banks are badly exposed to their own countries sovereign debt and therefore they will continue to be weak for sometime while countries grapple with their debt burdens. I don’t think there will be defaults but a continuation of extend and pretend. We are at, or very close to, the bottom of the interest cycle and I believe that interest rates will start to go up. This will be a slow increase and lag inflation which will help reduce debt. 1. We are in a deflationary scenario like the 1930s not an inflationary one like the 1970s. All the QE has been to offset deflation and it has worked. It hasn’t created growth, just maintained the status quo. What would we have seen without QE? 2. Corporate profits are up because of expense control and increased automation. This is great, this will set the scene for the next boom. Companies are lean and profitable and when demand returns we will see sustained growth. 3. The whole developed world has turned Japanese in my opinion (zombie banks, continual QE, low interest rates) but this won’t last forever. In addition, US house prices crashed and banks had to write off the debt (this didn’t happen in the UK or Japan). US mortgage rates are low and house prices are low and rising, this will help the US get back on its feet. Also don’t underestimate the impact of new technology (cloud computing, ipads et al) this is what the US excels at. As always timing is the issue, I am long term bullish but short term bearish. I expect a nasty correction in 2013 (20 – 30%) but not the bankruptcies we saw in 08/09. This uncertain landscape will last until 2017 with ultimately sideways markets from 2000, but good returns can be made buying corrections. All that I have written is only my opinion, there is no right answer. We all see the same data and interpret it differently. I respect all views and time will tell. PS – 1932 was a V bottom and then there was no looking back. Professor Jeremy Siegel suggests not to get on the short side this market just yet. Short term he sees 15000 on the Dow maybe 17000 by 2013 year end. Lots of cash sitting the side lines. My projection 15500 by April then roll when the real US and Euro fiscal crunch appears. Siegel never, I repeat “NEVER” has been bearish on the stock market. Please consider the source’s objectivity. Sunspots over 160… Major solar spot building. Put on the helmet. Nat gas, gold, oil and after the plunge all into equities. Question is just the exact moment. Looks like buildup to a major war in Middle East. We are overdue taking out the sunspot high of 208 in 2011, maybe this round of solar activity build up. John, how do you mean are overdue? Sorry my ignorance. We are building up to the solar maximum, but not in a straight line. 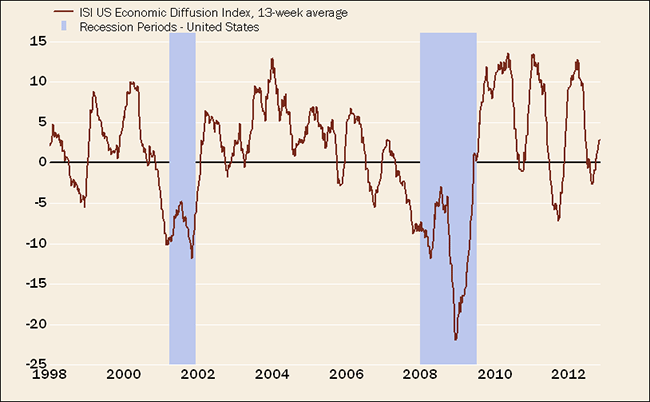 This chart shows how we have had a period of pullback, but the latest renewed thrust gets us back on track. Don’t forget to just close your eyes and buy the gap up. Lol. I will buy my 3rd (trading) long position when I see more gusto coming from the bulls. Ceasefire from bombing the Hamas is a reasonable anchor/catalyst for now. $SPX:$VIX. MA Envelopes gap above (my proprietary setting) confirmed this rally. William % turned green (higher than -20). Enough said.. Strongest market internal since July. Don’t short this market. and try to be cute. You are the cute bear because you have a long time frame. You have my approval to short this marlet. You see. Speculation is a fair game in that anyone can be cute if they want! However, The winners must have an edge and you do! A solid bounce. Now let’s see whether we are back in an uptrend or whether a lower low with positive diverence is needed. Interesting forecast by Nomura Strategist Bob Janjuah who agrees with Marc Farber that the market may rally one more time before going down. Unlike Faber, Janjuah’s forecast is for S&P to slump throughout 2013, bottoming out in 2014 at around 800 which is a steeper drop than Faber’s anticipated 20 percent drop to around 1,176. I feel that Janjuah’s more negative view may be the correct one. Wait and see. The calm before the storm up or down ;). Sunspots a little bit lower today at 122. Watching that sun like a hawk ;). Painfully slow internet here, so just a brief update below. Today I leave Penang for Langkawi, another Malaysian island. Don’t know what internet facilities are going to be like at our next place. If I go quiet at any point on this trip, you know why. So combined with the 4 in the main article, that’s 8 out of 8 either better or same, with some big jumps in Korea, China, and France. Germany and US data is out today (Wednesday) to complete the picture, but this increasingly looks like global growth is about to pick up, rather than we are heading into a global recession. The SP500 regained its 200MA and held it yesterday. Gold’s technical shaping looks increasingly like it is resuming its secular uptrend. October’s global climate report came in at about 8th hottest October in recorded history – not quite as extreme as mid-year, but keeps the year-to-date in the top 8 hottest years on record. Good to see you are enjoying third world infrastructure John. You must see so many opportunities and so much potential in Asia first hand, like the rest of us who travel around there frequently. Nothing better than seeing things with your own eyes and not just following leading indicators from a computer screen. That brings me to my question. You have wrote at least three posts convicting us (and yourself) that China is recovering. These included leading indicators, PMIs, Shanghai Composite Head & shoulder bottoms and all other type of stuff. So why is the Shanghai Composite not responding to all these points you made? The head & shoulders bottom has been negated and those who bought and now in a drawdown again. And it is not only Shanghai – KOSPI and Copper are looking weak. My question is why isn’t the market responding to the whole CNBC crowd stating a recovery is real in China. So many rate cuts, so much stimulus, so many indicators showing an economic bottom. So, where are the buyers and why aren’t prices rising? If the economy is turning a corner and the markets are so cheap, whats the go? Fair comment Tiho. It hasn’t taken off ‘yet’, and value plays can sometimes need time. I acknowledge the risks in China – breakneck growth and structural imbalances. But it’s a risk-reward calc as always, and the combination of cheapest p/e since inception, pick up in leading indicators, and technical picture give me trade I want to take. If I’m wrong and it continues to sink, then I would buy more lower, but I believe there is a fair chance of a bottom right here. Looking the weekly chart on Shanghai. Price is resting on support line from 2010. RSI indicates a small divergens and as long this support line on RSI is not brokken it could indicate that price will move up in 2013. Yes spotted that too, thanks Niels. Too much speculation about secondary things. Follow the sun. Everything is just a manifestation of solar. Markets only go up or down. You can make money in both directions without prediction. Successful bond sale in Spain; ceasefire in Middle East; lower price of oil; and highest China PMI reading over a year shall be supportive of the stock market going a bit higher despite/counteracting the Fiscal Cliff fear . Not so sure how well PMs will do in the near turn. Chris Ciovacco showed (below link) a chart of GLD:SLV ( currently at the neckline of a H&S) where SPX would win if the ratio dips below the neckline. The market structure is very much like the June bottom . ES future dips are bought. Bulls have the better odd of winning. I will hold my long positions and see how things evolved. Thanks Edwin. New post coming up… internet fine in this new place.